Rumsey Press / Elvira Dibrigit, 9780692840634, 140pp. Do you wish you were farming? Or do you want to know more about why and how your local farmer makes a living off the land? For people who want to know the whole truth about life as a modern day farmer; here is an easily accessible book of interviews that features fifteen farmers, each with different agricultural methods and business models. From conventional to organic, Permaculture to Big Ag, from wholesale to mail-order, from single crop to wide product diversity, this little book covers them all. In these interviews, farmers share the stories behind their work and their lives on the farm; the business side of production, the personal challenges they face, and words of advice for the would-be-farmer. DiBrigit asks hard questions and gives a reverent yet realistic picture of a thriving local food system. 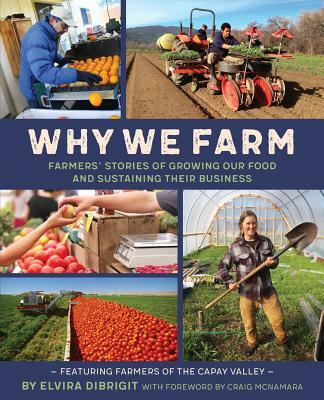 "Why We Farm is the book for all the wannabe farmers to take to bed at night. I couldn't put the book down. DiBrigit tells a great story - an American tale about the cycle of rural life as its pioneer farmers and farm families reinvigorate America's rural valleys. Wells go dry, water quality is poor, people divorce - all told from sitting at the kitchen table with the farmers she features, or walking their fields. Though each farmer farms and markets differently, their stories provide a glimpse into a business model that's always changing - usually as a result of hard work, ingenuity, grit and luck. In responding to the call of the land, these farmers have brought life back to our beautiful Capay Valley, which DiBrigit captures so ably on the page in all its complexities." business. Although farming is a tough livelihood, the farmers come across as happy in a profound way that eludes many city dwellers. There's a lesson there, along with the stories."